For a long time I've tried to stay away from using ATG tape. Mainly because of this cost. Back in the 90's I used a wonderful refillable liquid adhesive that had a unique roll-on dispenser. It was the perfect adhesive and it was affordable. to make a long story short, the glue and dispenser went off the market and I was forced to find a replacement. I make a lot of cards, a really lot of cards so I have to consider the cost that goes into making them. Because I use the best possible papers and inks I want to have the best adhesive possible holding it all together. So far using the ATG gun has been the best type of adhesive, but it is really too expensive and I still have to have on hand, score tape and several liquid adhesives. About a month ago I came across a glue called 'The Best Glue Ever' I bought a bottle and I've been putting it through it's paces. My hope was to have one 'go to' glue. One glue on my desk, one glue on my order list - saying good by to paying ATG prices. I calculated by usage, my one bottle of BGE @ $7.49 makes as many cards as $24.00 worth of ATG Tape. And I don't have to worry about a "bad roll" or changing the tape in the gun. It even replaces my glue gun! This won't replace my foam dimensional tape - I don't need it too! it will replace my liquid hot gun and tape glues. Metallics, glitters, embellishments, heavy papers, thin papers. the card has no wrinkling, warping or buckling. I'm sharing this as my honest, unpaid for unsolicited review because I found something I love as a card maker and something that will help me save money! Here is my Freebie for your card making! I will try your glue. I'm always looking for that "perfect all around" glue. Love your card! Thanks for the recommendation. I agree, adhesive is one of the most expensive supplies for card making. Where do you buy the glue? I have been using Art Glitter Glue, but would love to find as good as AGG in a store so I don't have to pay shipping. Thanks for asking, I just made sure my link works - it wasn't! Thank you so much for sharing this! Anything that helps me save money is always a plus. Also, it will open up space for something else by eliminating things I won't need any longer. Thanks!!! Just remembered that I didn't thank you for the beautiful freebies! Also, your card is amazing! Don't mind me...my old-timer's is showing today! Wow, Thank you so much, Virginia!!! As for foam tape...I do have an alternative:) I use a bit of corrugated cardboard adhered with the Best Glue Ever. It's cheap, environmentally friendly, and always available in any shape or size I need! Just a dot of Best Glue Ever to adhere the cardboard square to the item, and a dot of glue on the other side to adhere it to the card or project. (Save a supply of several different thicknesses of cardboard for even more flexibility) or reach into your recycle bin and grab a piece of whatever is handy! 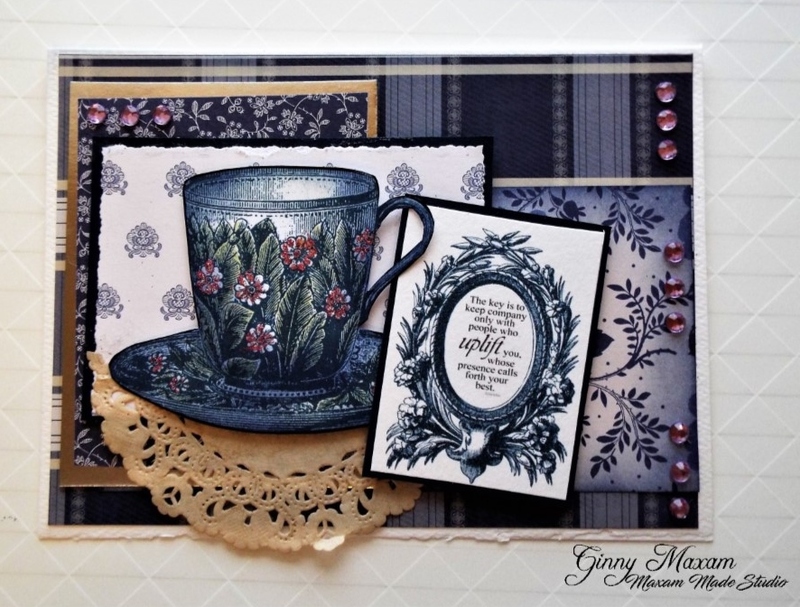 Thank you for the freebies Ginny, and I do love your stunning card. Thanks for the tips about the glue too. Love this card, sis wonderful images thank you, andyou've used them so beautifully .. thanks for heads up on glue too. Beautiful card! I also use the Best Glue Ever and I love it! It adheres to everything and you only need a little bit. Your freebies are beautiful! Thanks so much for sharing them! Always looking for good glue, and love Ginny's Tea cups! Thistle make you smile and a freebie! Friday Fellowship and a freebie! Vintage Lace Flowers and a blog hop!